Did you ever hear of a Husky fur hat? Mittens? 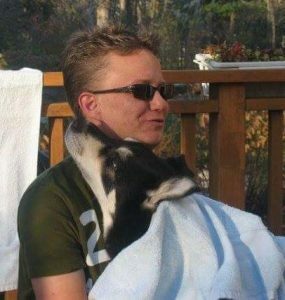 Scarf? 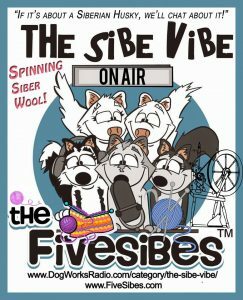 How about “siberwool?” Well, on today’s “The Sibe Vibe” show we will be hearing how to make these Husky creations with our guest Cheryl Dawson, lead siberwool spinner for the Save Our Siberians Siberspace Rescue Fund (SOS-SRF), volunteer board member, recording secretary, and Siberian Husky mom. 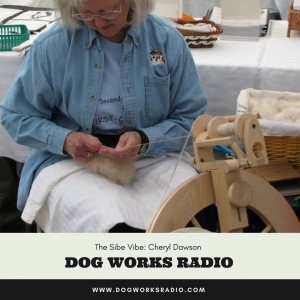 On today’s show, we will also hear all about how Cheryl first became interested in spinning, how she gathers Siberian Husky fur and turns it into Siberwool, the warm and cozy items she makes with it, and how this fur-based yarn helps Huskies in need. For more info on how rescues can apply for assistance, Success Stories, info on their fundraising auctions, and more, visit the SOS-SRF website at:www.SOS-SRF.org. For more information on spinning siberwool,visit:http://www.sos-srf.org/FurSpinning.html. 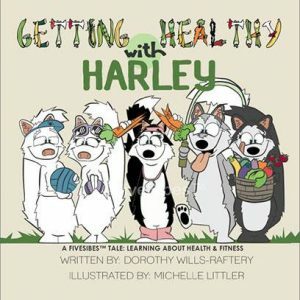 Named “Best Author” in 2015 & 2016 by Hudson Valley Magazine, and all four of her books named “Best in Print” by American Pet Magazine, Dorothy is a 5-time Dog Writers of America Association “Excellence” nominee, including a nod for “Excellence” for the “Talking Canine Epilepsy” episode of The Sibe Vibe featuring Dr. Karen Muñana and Julie Nettifee of North Carolina State University College of Veterinary Medicine. In 2016, Dorothy was awarded the prestigious Maxwell Medallion for her blog article on rescue dogs in FiveSibes. Her book, EPIc Dog Tales: Heartfelt Stories About Amazing Dogs Living & Loving Life With Canine Epilepsy was selected as the NYC Big Book Award for 2017 in the Pet Category. An official International Purple Day® for Epilepsy Ambassador since 2012 and a volunteer case manager for The Wally Foundation-Canine Epilepsy, Dorothy is the creator of the FiveSibes #LiveGibStrong K-9 Epilepsy Awareness and educational campaign inspired by her own Epi-dog, Siberian Husky, Gibson. In addition to her Siberian Huskies, Dorothy shares her home with her husband, daughter, son-in-law, new grandson, and an adopted feral kitty. You can follow Dorothy and her FiveSibes on social media over on their website at www.FiveSibes.com and at FiveSibes: Siberian Husky K9 News & Reviews on Facebook. 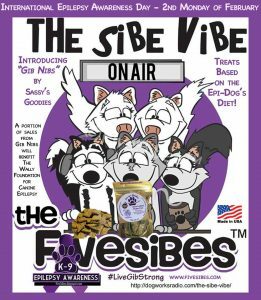 Today’s show is our annual Purple Day® for (K9) Epilepsy episode of “The Sibe Vibe,” during which we are very proud to make a very special announcement about the debut of a brand new program—#Paws4Purple—a joint partnership between “The Sibe Vibe” host, author, and the FiveSibesMom, Dorothy Wills-Raftery, and The Anita Kaufmann Foundation. #Paws4Purple is a great informational resource to help caregivers of Epi-dogs (dogs with Epilepsy) worldwide. Our guest for this episode is Ann Marie Bezuyen, author, Epilepsy advocate, and Director of Special Projects for The Anita Kaufmann Foundation (AKF), whose mission is to educate the public not to fear Epilepsy and seizures. The AKF is a global sponsor for the largest Epilepsy awareness initiative in the world, “Purple Day,” which Ann Marie helps coordinates worldwide. Her programs include “Heads Up For Vets!” in collaboration with the Department of Veterans Affairs Epilepsy Centers of Excellence. As Program Director, she also supervises AKF’s Siblings Space Program, Lavender Project, 5th Grade Educational Program, Lace Up for Epilepsy Program, and The Great Purple Cupcake Project for Epilepsy Awareness. 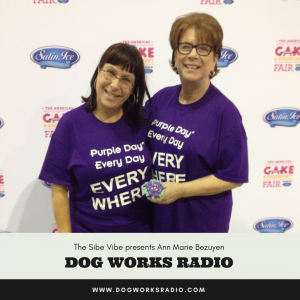 Most recently AKF is now presenting #Paws4Purple, the first AKF Canine Epilepsy project, with “The Sibe Vibe” host, Dorothy Wills-Raftery. Ann Marie received her degree in education from William Paterson University, and has been an epilepsy advocate and educator since 1995. She is extremely passionate about eliminating stigma through educational awareness programs and to that end, she coordinates Epilepsy trainings in person and nationally and internationally via Skype. She works daily with persons with Epilepsy and their families on an individual basis. Ann Marie is an invited local radio and public television guest, as well as the author of several research papers and magazine and newspaper articles. Photo: Ann Marie Bezuyen, Director of Special Projects for the Anita Kaufmann Foundation (AKF), with the AKF Executive Director Debra Josephs. To learn about #Paws4Purple, a new partnership program on Canine Epilepsy by FiveSibes™ #LiveGibStrong and The Anita Kaufmann Foundation, visit: http://purpledayeveryday.org/paws-4-purple/. Note: You can also request hard copies to be mailed, or download digital versions of the #Paws4Purple flyers and bookmarks from this site. To read more about The Anita Kaufmann Foundation, visit: www.akfus.org. Learn the origins of Purple Day® and its founder, Cassidy Megan, here: www.PurpleDay.org. 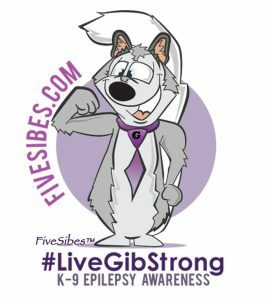 Note: Be sure to check out the special annual FiveSibes #LiveGibStrong Purple Day Blog Hop on the March 26th post of the FiveSibes blog. On today’s show, we welcome back Nanette Willis, owner, creator, and baker of Sassy’s Goodies in Springfield, Missouri, a US Military wife, and Siberian Husky parent to Sassy (her company’s namesake), Bentley, Jake, and Sassy’s little girl, puppy Bella. * Nanette, who has joined in our FiveSibes #LiveGibStrong K-9 Epilepsy Awareness and Educational Campaign, is the baker behind the new “Gib Nibs” – a wholesome, gluten-free, dog treat created with healthy ingredients with the Epi-dog in mind that was debuted on International Epilepsy Day, the second Monday of February. The treats are handcrafted with organic oats, homegrown veggies, and homemade beef pureé. Nanette also says they are low in fat, gluten-free, and contain no salt, rosemary, sugar, or preservatives. 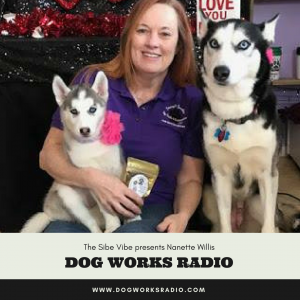 The “Gib Nibs” recipe is based on the FiveSibes wooly Siberian Husky Gibson’s diet, that Nanette says are also good for dogs with diabetes, and a treat that all dogs will love the taste of! Nanette will also be perennially DONATING a portion of sales from each bag of “Gib Nibs” to The Wally Foundation (TWF) for Canine Epilepsy. TWF offers possible financial assistance to help families, rescues, and fosters of dogs diagnosed with idiopathic Epilepsy. For more info on The Wally Foundation~Canine Epilepsy, visit their Facebook page at: https://www.facebook.com/thewallyfoundation/ or visit their Website at: www.TheWallyFoundation.com. 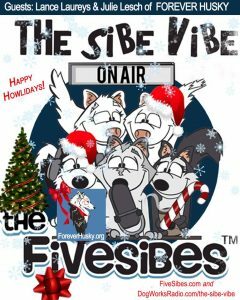 On this special “howliday” edition of The Sibe Vibe, host Dorothy Wills-Raftery is speaking with Lance Laureys, founder and president of Forever Husky rescue, and joining Lance is Julie Lesch, board member and Co-Director of Fundraising, Events & Social Media. Forever Husky is located in Crystal Lake, Illinois. During this show, we will be talking all about the rescue; how folks can help Huskies in need not just during the holidays, but every day; and about Forever Husky’s new “Be a Santa Paws: Sponsor a Forever Husky for the Howlidays” program, where folks can make the season bright by playing Elf for a Husky in need! Lance Laureys, founder & president of Forever Husky. 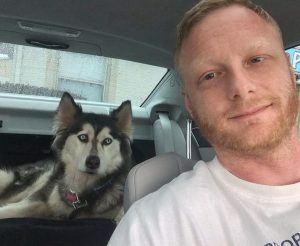 While serving as a passionate volunteer to help the many dogs at a local Husky rescue, he discovered that the public really didn’t understand the Husky breed. It was clear to him that people interested in adopting Huskies, liked their look, but that they had no idea what they were getting themselves into. As a result, Forever Husky was born to educate the public about what it really means to own a Husky—from typical traits to training to nutrition to veterinary care. After a year of educating the public, Lance and the Forever Husky volunteers decided to take the rescue to the next level. After becoming a qualified non-profit, Forever Husky began rescuing Huskies, advancing opportunities to educate about the breed and support the community, adopting to qualified homes and listening to how they could improve. In Lance’s spare time, he enjoys boating, 4-wheeling, dinners out, landscaping, cars, driving, and spending time with the horses. Ever since he was a kid, he’s been surrounded by dogs and horses and knows the ins and outs of what it means to provide quality care for them. His mottos are: “Do it right the first time” and “Chop Chop” (meaning get ‘er done). His family and friends would characterize him as compassionate. They say he would give you the shirt off his back and help everyone out if he could. And, he does! Julie Lesch, volunteer Board member and co-director of fundraising, events, and social media. Julie is primarily responsible for public relations, branding, graphic design, marketing, advertising, and all the analytics that go along with it. Julie started in rescue in 2008 doing transports for various rescues. Feeling that she could do more, in 2011, she joined the rescue where she and her wife had previously adopted their two Husky-mixes. They added a third Husky-mix to the family later that same year. While in that role she worked with a team of adoption coordinators and completely revamped the entire adoption application process from submission through scheduling and focused much effort on improving the rescue’s presence on social media. Still feeling that there were opportunities to improve, she joined Forever Husky in 2014. Because it is Forever Husky’s mission to help Huskies and support, as well as educate, the community and because Julie believes that “when you know better, you do better,” it was a perfect fit. 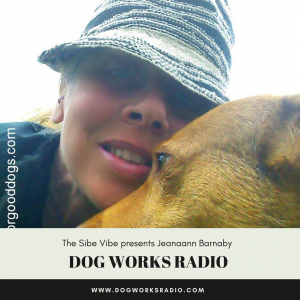 Jeanaann Barnaby has lived and worked with dogs her whole life. She has both worked professionally & as a volunteer in several animal clinics and animal rescues in her hometown of Toronto, Canada. At present, in addition to being Hu-Mom to Suzy Q the Rotti/Hound cross, G.G. the pot-bellied pig, and cats Dottie and Jerry Underfoot, she is also the Hu-Mom of Olivia, a Bull Terrier/Lab mix who was adopted from a shelter in February 2011, and is an Epi-warrior and Canine Epilepsy ambassador whose Facebook page, Oh, the Life of Olivia, has over 11,000 followers. Jeanaann began making hemp toys for Olivia, and then for friends’ dogs, and soon launched her own home business, Knotty Toys for Good Dogs, where she says Olivia is the CEO (Canine Executive Officer)! In addition to her store, Jeanaann also shares information on Canine Epilepsy Awareness in her blog as well as on Oh, the Life of Olivia page, and she donates a portion of her Knotty Toys sales to The Wally Foundation~Canine Epilepsy (TWF), where she is also their online communications director. TWF is a non-profit organization that offers possible financial assistance for much needed anti-seizure medications to families, rescues, and fosters of dogs diagnosed with idiopathic Canine Epilepsy.